Surrounded by the beautiful landscapes of Door County in Wisconsin, the Landmark Resort is a comfortable and casual self-catering-style hotel that offers a relaxing getaway for both business and leisure travelers. 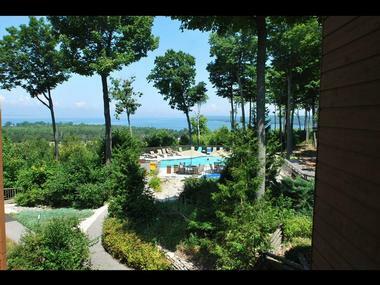 Set on 40 acres of wooded bluffs, which form part of the Niagara Escarpment, the Landmark Resort features 294 tastefully-appointed one-, two-, and three-bedroom suites with en-suite bathrooms, fully-equipped kitchens, living and dining areas, and private decks or patios with gorgeous views. 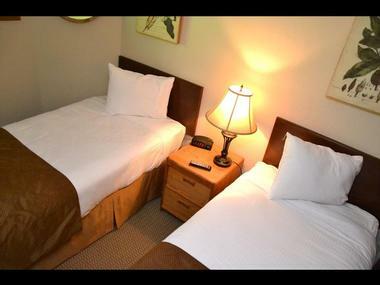 All units have modern amenities such as air-conditioning, flat-screen televisions with cable channels, sleeper sofas for additional guests, and complimentary high-speed wireless Internet access. Upscale facilities at the resort include four swimming pools, three of which are outdoor and open seasonally, and one indoor, which is open all year round; whirlpools and steam rooms; a fully equipped fitness center, games room, tennis courts, and shuffleboard. The Landmark Resort features 294 tastefully-appointed one-, two-, and three-bedroom suites with en-suite bathrooms, fully-equipped kitchens, living and dining areas, and private decks or patios with gorgeous views. There are 16 different lodging options at the resort, all of which feature king or queen-size beds dressed in luxury linens and hypoallergenic pillows, and en-suite or shared bathrooms with walk-in showers, soaking tubs, or combinations of both, fresh towels, bathrobes, and organic bath products. Located on the lower level of the building, Amenity Level Rooms are located water-side and have private patios overlooking the gardens and grounds, while Main Level Units are located on the entry level of the Harbor, Flagship and Navigator buildings and enjoy private balconies and patios overlooking the water. Premiere Rooms have spacious living rooms with comfortable seating and modern amenities and feature one or two bedrooms with en-suite bathrooms. Lofted Suites feature two bedrooms, with the second bedroom being a semi-private loft overlooking the living and dining room areas of the suite, and Enclosed Suites have two enclosed bedrooms. Two-Bedroom, One-Bath Enclosed units have two bedrooms and one bathrooms which are located on one level, and Two-Bedroom, Two-Bath Enclosed units have the same with two bathrooms. 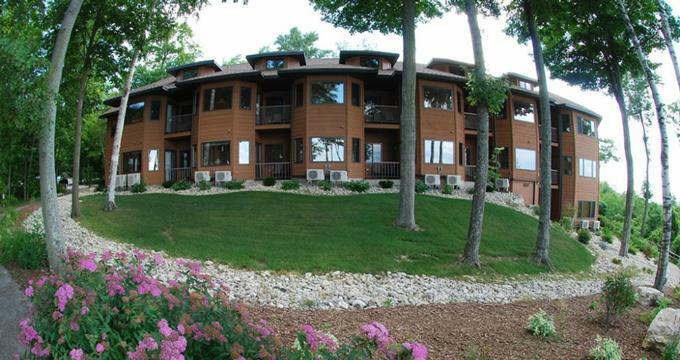 Water View Suites have beautiful views of the tranquil waters of the Bay of Green Bay, and Woodland Views look out over the woodlands surrounding the property. One-, Two- or Three-Bedroom Suites have multiple bedrooms with king or queen-size beds dressed in luxury linens and hypoallergenic pillows, and en-suite or shared bathrooms with walk-in showers, soaking tubs, or combinations of both, fresh towels, bathrobes, and organic bath products. Units have fully equipped kitchens with appliances, including fridges, microwaves, coffeemakers, and utensils needed for self-catering purposes. The Landmark Resort offers a wealth of amenities, facilities and guest services for guests, including four swimming pools, three of which are outdoor and open seasonally, and one indoor, which is open all year round; a fully equipped fitness center, a business center with computers and copying, printing, and faxing services, and complimentary wireless Internet around the property. 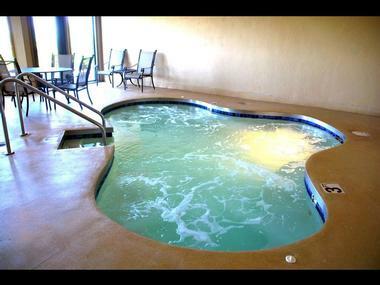 The resort also offers whirlpools, steam rooms, a games room, tennis courts, a basketball court, two shuffleboard courts with equipment available at the front desk of the hotel, and a pickleball court. There is a children’s playground, an electric charging station, free parking for guests, outdoor picnic areas with gas grills, on-site laundry facilities, the Carrington Pub & Grill, which offers casual dining, along with room service and take-out menus, and fire pits for bonfires. A library is fully stocked with books, board games, and DVDs, beautifully landscaped grounds offer tranquil places to relax, and a full complement of staff is on hand to help with every need. With over 40 acres of beautiful wooded grounds, luxurious accommodations, a full service bar and restaurant, and professional and knowledgeable staff, the Landmark Resort is one of Door County's premier wedding locations. Door County offers a variety of activities and attractions, ranging from state parks, lighthouses, and art galleries to over 300 miles of shoreline dotted with lighthouses, exquisite natural scenery, miles of hiking and biking trails, and beautiful beaches. There are also more than 4,000 acres of cherry and apple orchards, quaint villages to explore, plenty of wineries to enjoy, and renowned festivals throughout the year.